We have two basic choices in life. To live in appreciation, or To live in condemnation. To live in appreciation of all that we have and all that comes to us – without judging it as “good” or “bad” – we acknowledge the gift and increase its value. That’s what “appreciation” means – “to increase the value of.” To live in this mind-set is to allow for our transformation to a higher existence. To live in condemnation is to live as a victim. It is to see everything as “not enough” or a negative outcome. It is to see only suffering and lack and squalor. Life becomes a burden to be endured, a prison sentence. To live in this manner is to condemn ourselves to a lifetime of unhappiness, anger and resentment which can eat us up like a cancer and may even manifest itself as some form of debilitating disease. It is our thought process that determines where we dwell. This is not to deny that life has its challenges. Life is composed of miraculous events and horrific mishaps, and all degrees of happenings in between. If we expect challenges to be “normal” then we take them in stride. Champions use them to strengthen determination. Quantum Physics tells us that without Resistance, there can be no Creation. So when we see Resistance as “normal” we realize that we are in the process of Creation, that our goals or intentions are being birthed with a little help from the natural laws of the Universe! There are times when I find myself in a dark place in my mind, but just as quickly as I recognize it I can choose to move out of it. I can choose to dwell in the realm of infinite possibilities rather than stay stuck in limitation. Always, it is mine to determine. One source from the EU reports 2 incidents of “accidental” release of poisonous gas from a U.S. Military plane. Another possibility is the use of ELF, or extremely low frequency magnetic fields measured in Hz. When transmitted at a frequency below normal, this frequency can cause mass depression. When transmitted at above normal frequency, it can provoke violent behavior. World powers have experimented with this from satellites for years against one another. Another explanation is the release, either accidental or on purpose, of poisonous gas by a U.S. military plane. It appears that the culprit is the poisonous gas Phosgene that is described as one of the most feared chemical weapons ever used due to its ability to literally cause the lungs and respiratory system to explode. 2. Contact your local government representatives by email, letter or phone. 3. Post on your social media sites and any blogs or websites you maintain. 4. Email and contact any organizations that you belong to. Find environmental groups on Twitter and Facebook also and ask them to get involved in demanding officials get answers to the public. 5. Contact through email and by phone your state and federal government representatives and heads of appropriate committees in addition to your local reps.
7. Meditate with others. Create a focused intention to bring healing to this situation. We, as Humans, do not exist separate from other Beings, or the Earth Mother, Herself. We are all One. We are interconnected. There can be no mass destruction of life in this manner that does not also have its repercussions for us as co-inhabitants of this planet. Whatever the cause of the mass destruction of life that has taken place, there is time and need to turn it around. Focused intentional Thought can achieve this. I have been privileged to witness on many occasions miraculous outcomes as the result of a small group of committed individual sharing a common focus with intention at a specified time. There are those who come together once a year at sacred Ceremonial Grounds to spend four days in a focused physical and spiritual offering of the Mind-Body Temple to bring Harmony to the Earth and her People; to all Living Beings. Out of these four days I have witnessed those who came as supporters experience physical and emotional healings. During those four days communications come in from all over the world sharing healings and answers to prayers that were sent to be requested during the Ceremony. Wars have been terminated or diverted. Peace accords have been forged. Assaults to the Earth Mother have been resolved…the list goes on. These things are real. They are facts. Quantum Physics tells us that simply the act of thinking about it can change the basic nature of matter. We are energy. Thought is energy. The Human Mind is capable of radiating an energy that interacts directly with matter. Prayer as a focused intention releases an energy emanating from the Human Mind that can directly effect the environment. It can influence the behavior of particles of energy. Multiplied by hundreds or thousands of people focused on the same intention at a particular time, the impact can be revolutionary. You can call it coincidence, but in my life with my Elder, Grandmother Pa’Ris’Ha, I have witnessed far too many occurrences of this Principle to know that it is so. I invite you to join the many who will be coming together in a focused intention of Global Peace and Prosperity at the precise time that aligns with the following locations. We can make a difference. All it takes is knowing that we can. We Are One. There are people of all Faiths and all Religions coming together to pray and to focus/meditate on celebrating global peace and prosperity at this time. Join us in your places of worship and praising of all good things. There are focused points (meaning religious orders and groups and organizations) all over the world that have validated their participation. We are already millions strong, so if you cannot get with organized efforts in other places, do your own; gather with family, neighbours, work, and in public places with those who are willing to take a moment and know You are, because God Is. 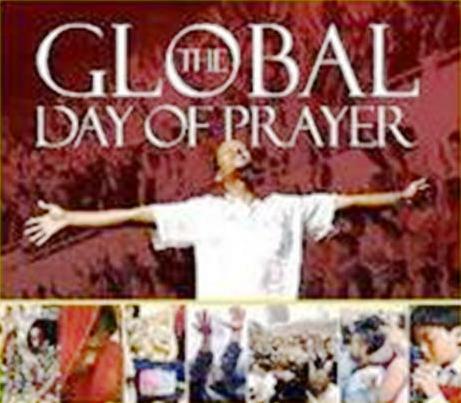 Serve the World with intent on peace and prosperity this season….Pray and Meditate with us!!! I am a network marketer. Tonight I spent time with one of the top producers in my company and listened to him share a little bit about his story. What impressed everyone in the room most was what he shared with us about how he rebounded from a $17,000 chargeback on one account. I personally was also impressed by that fact that it only took him 6 months to do so. Some people take years to balance a debt like that! His account of this occurrence was inspiring because he never lost faith in himself or the company, and he NEVER CONSIDERED QUITTING. So today he is a Group Benefits VP and in addition to being a 6-figure income producer, he is part of the growing millionaire’s circle. Spiritual Mentor and my Elder Grandmother Parisha has coached some of us in business ventures, as well as life challenges. Her constant message: Winners never quit and Quitters never win! In the traditional ways of Grandmother Parisha’s people, The Warrior’s Society are the protectors. They are also the “action” people who serve the community and get things done. Each of us face daily “battles” – whether with seemingly outward circumstances, or inner conflicts. Quantum Physics shows us more and more that we create our outer circumstances through our thoughts and inner dialog. We are who/what we believe. That’s the mind-set of the Champion. Champions don’t quit. They don’t always have a smooth road to victory. In fact the Physics Principle of “For every action there is an equal and opposite reaction” tells us that the greater the intention we put forth, the greater the opposition that will come back as a response. Rather than fear obstacles (opposition) Grandmother Parisha teaches us to see them as the measure of the power of what we have set out to do. She embraces the opposition, resolves it, and achieves her intention. We all have the Warrior within us. We are all Champions. So long as we stay on the playing field, we will have our day. The more we embrace creating our reality we transform ourselves from victim to Victor. It would seem that we as a Human Family are on the brink of an epiphany: That we are really One, that caring is more powerful than hurting, and that the smallest act of kindness can make a difference not only in a person’s life, but indeed the entire fabric of Humankind. After a rash of youth suicides attributed to bullying over the past few months, there has been an outpouring of support and encouragement from nonprofit organizations, religious and humanitarian groups, and most notably thousands of personal messages through the “It Gets Better Project” from LGBTQ and straight people alike assuring those who might be in a challenging time of their life that a better experience awaits them. To summarize, this is a simple outline for 7 days of expressing appreciation and gratitude and taking action of being good to ourselves and reaching out to others. By focusing on gratitude, we feed our faith and our strength to handle whatever might come our way. There are no stumbling blocks, there are only stepping stones. People guiding my early days of recovery told me to make a gratitude list. For every pain or fear or negative thought I could come up with – I had to find the “gift” in it. It wasn’t easy at first, but after a while I got the hang of it. Today it has become second nature – when I choose to exercise that simple wisdom. Grandmother Parisha, along with other great mentors, teaches that, We Are What We Think. We Create our Experience – Our Reality, if you will. Some look at the world today and see “the brink of destruction.” Others form service organizations or special relief missions or campaigns; millionaires Bill Gates and Warren Buffett created the “Giving Pledge” to encourage philanthropy; average citizens, celebrities and political leaders worldwide have joined in to let our youth know “It Gets Better” in an outpouring of love and encouragement that brings tears to my eyes every time I view one of the thousands of powerful messages! There are tremendous Expressions and Acts of Love and Caring happening every day all over the world. It’s growing exponentially! Typically the example of achieving Critical Mass is that one-by-one-by-one individuals can effect change. When enough individuals join together in a common action or thought, change occurs. Here’s the good news: “Critical Mass” by scientific definition is achieved at 51%. That’s the point where the “scale tips” in the other direction. We’re gaining momentum and moving toward a Human Evolution (or Revolution, if you will!). Grandmother Parisha is quoted as saying, “The world will not end. It will be transformed.” We are being transformed by the actions we are taking today. So get on board! 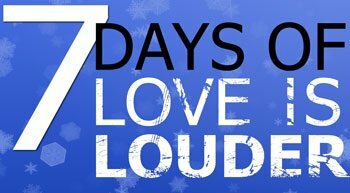 Take part in “7 Days of Love is Louder” – share it with your friends, family and co-workers. Share it with strangers! We are making a difference for Humankind today. Join the movement! Scientific Research has been reporting findings of the ability for focused thought to affect physical matter locally and non-locally (from a distance). Here’s just one brief comment I found while trying to find my notes from some published NASA experiments on the subject (which I couldn’t – sigh) Note: the bold type is my emphasis, not part of the original article. Want to Help in the Gulf Oil Crisis? A dedicated group of individuals will gather July 9th-10th-11th-12th-13th-14th in a special Global Prayer-Meditation for the Healing of our planet and her People. Go there and make the pledge to join in this energy. Let’s create a Circle of Healing that goes ’round the globe. The Law of Critical Mass proves one-by-one-by-one WE CAN MAKE A DIFFERENCE!